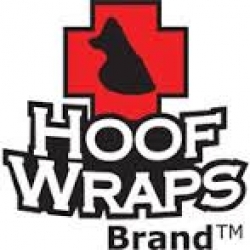 Hoof Wraps is a multi-use, multi-purpose bandage for everyday horse hoof care and protection. Our special bandages are user friendly and come with a numbered step by step system printed directly on the bandage for easy application on your horse's hoof. You can easily treat common hoof problems like horse hoof abscess, thrush and stone bruise, or use for protection after shoe loss. We designed Hoof Wraps specifically for horses on turn out so your horse can still enjoy the freedom of mobility during treatment. You'll appreciate the durability and convenience of a one size fits most bandage system along with all the time and money you'll save by not having to make and remake home-made bandages.